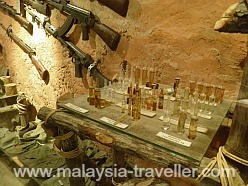 Port Dickson Army Museum is one of Malaysia's best museums and I would rank it alongside the Royal Malaysian Police Museum with similar style and presentation. 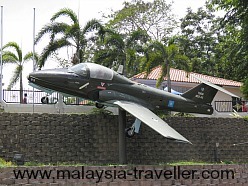 It is located next to an Army base at Port Dickson, which has long been a military town as well as being a leading beach resort. 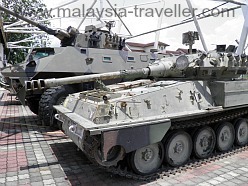 Photos: Some of the many armoured vehicles, transports and weapons on display at the Port Dickson Army Museum. The museum is housed in two old army buildings and comprises 9 galleries and a number of outdoor exhibits. The galleries include a look at the army through the ages from the 16th century Melaka Sultanate, through the Portuguese and Dutch eras and then on to the British era from which the modern Malaysian army can trace its roots. 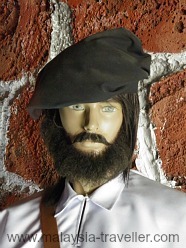 Photos: (L)Johnny Depp lookalike in the Portuguese era gallery. 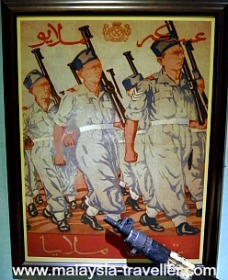 (R) Recruitment poster for the Malayan army. Another gallery focuses on the Japanese invasion and occupation and displays interesting items from that period. 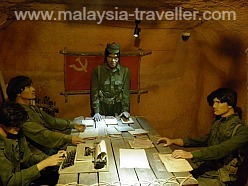 For me, one of the most fascinating exhibits is the Communist Party of Malaya (CPM) Tunnel which is a mock-up of an underground network of tunnels of the type used by the communist terrorists during the Emergency. Inside these tunnels, the bandits slept, ate, planned their attacks, treated wounds and illnesses, and carried out target practice. The tunnel is a little dark in places but well ventilated. Photos:(L) Vials of medicine and weapons in the CPM Tunnel. (R) Communist Terrorists plotting strategy. There is also a gallery on the modern army and its peacetime roles such as UN peacekeeping missions. 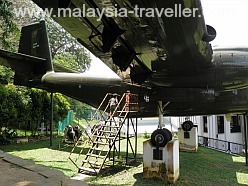 In the grounds of the museum are a steam locomotive, named Alor Gajah, various military aircraft and helicopters, a selection of armoured vehicles and a number of field guns and artillery pieces. Photos: There are a number of aircraft and helicopters on display at the Army Museum. There is also a small trail with mini rope bridges and some picnic gazebos. Other facilities include an audio-visual hall (closed during my visit), a café, souvenir shop, surau, toilets etc. 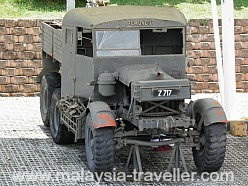 Photo:Alor Gajah steam locomotive and railway carriage at the Army Museum. 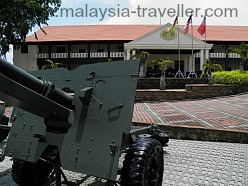 The location of the Army Museum is shown on the interactive map on the Top Negeri Sembilan Attractions page. The museum is clearly sign-posted as you approach Port Dickson on the Seremban-PD Highway. The museum is open daily from 9.30am - 6pm.